The Proper Way to Squat | BEAT Fitness in Wexford, Pa.
A movement everyone performs everyday and multiple times through each day is the squat. Whether it is sitting down onto a chair or standing up from getting out of bed we are performing work in the form of a squat. The movement is seen in the lower body and involves the gluteal muscles, quadriceps, hamstrings and other small accessory muscles within the legs as well as abdominals. However, with as many times a one squats in a day most still perform the movement incorrectly. We tend to engage the quadriceps more than the gluteal muscles which is the correct muscle groups we should be using in order to prevent injury. 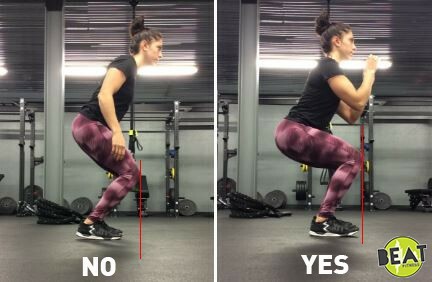 There are many other errors typically seen when one squats and in this workshop you will learn those errors as well as ways to correct them in order to prevent injury and improve activities of daily living as well as how you use the squat in exercising. Error #1: Hips do not reach back to engage glutes as one flexes at the hips to begin the squat. Correction= Practice using a chair, wall or object for support to hinge at the hips creating that hip flexion while squeezing glutes. Focus on body weight through the heels, feet are hip width apart and knees are splade. Using a resistance band can help to practicing engaging the gluteal muscles as well as keeping knees apart. Error #2: Knees begin to go over toes, while sitting down into the bottom position of the movement. Same movement occurs when trying to stand, knees go over toes and crash inward. Correction= Place a chair behind knees or other stable surface to hinge back and sit on to make sure knees shift back and pull apart instead of coming forward and crashing inward. Use chair or surface to push off from, weight in the heels and use a band to help engage the glutes in order to pull knees apart. 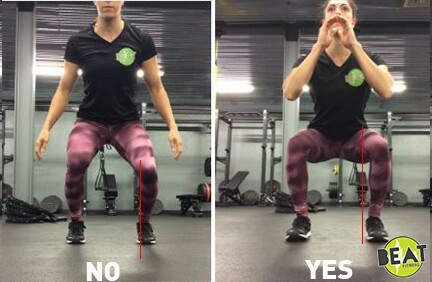 Error #3: After hitting bottom of the squat, breathing patterns are incorrect and one is either holding their breathe or inhaling as they are coming to the standing position. Correction= Breathing is very important no matter the movement the body is performing. For the squat you inhale on the way down during the eccentric contraction and exhale when pushing through the heels to stand during the concentric contraction.